Meet the latest Boy Bag design from the Fall Winter 2017 Collection Act 2. Some Boy Bags like this one haven’t been featured on the Chanel website, so make sure you visit the boutique to check what’s new. This Boy Bag do not need any introduction, it’s one of the iconic handbags of the house. But each season, Chanel will introduce a new variation. They will make small changes like new embellishment, new colors or slightly different look. All the signature elements will remain the same though, like the shape and the Boy Clasp. This new Boy Bag is made in silver. The Boy Clasp and the Chain is also crafted in silver hardware to match the shade of this bag. The new thing about this design is the quilting in the center. First of all, the quilting is done with large stitching to make it stand out. Then each diamond (or Rhombus) is partly embellished with glitters to create a triangle-shaped quilting. This bag is different, unique but also very classy. You can carry it as an everyday bag, but it’s more suitable for special occasions. This bag is perfect especially if you love the silver color. The interior of this Boy Bag is the same like all other Classic Boy Bags. Inside you will find the main compartment and a zip pocket. Currently we do not have the prices for this bag. 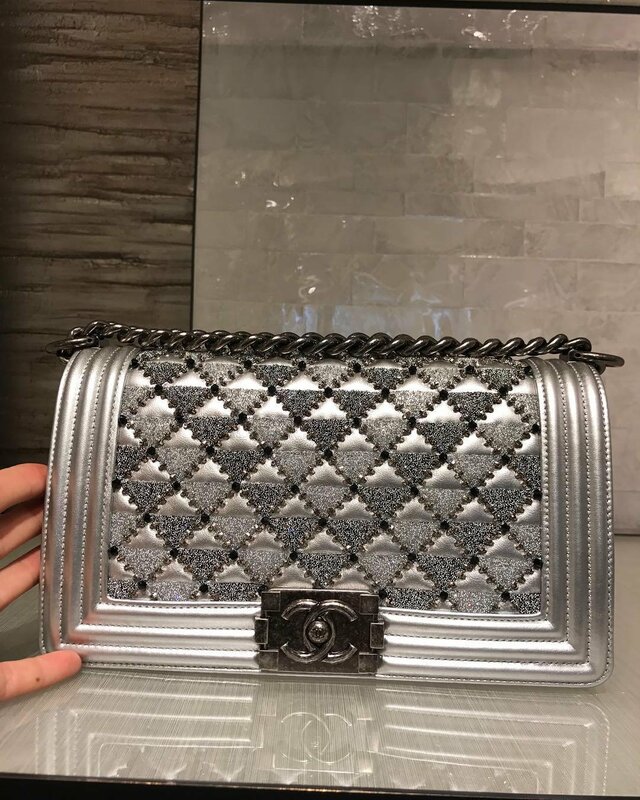 To check the style codes and sizes of this bag, please go to Chanel Bag Prices.